A trio of veterans and a well-trained group of first-time “Yaggers” will be involved in judicial, legislative and media events in Cleburne’s second year of competition, following a 20-year hiatus. A delegation of 21 Cleburne High School students will be among the competitors at Saturday’s YMCA Youth and Government District Conference. A trio of veterans and a well-trained group of first-time “Yaggers” will be involved in judicial, legislative and media events in Cleburne’s second year of competition, following a 20-year hiatus. In the 2017 revival of Youth and Government at CHS, every participant advanced to state, reflecting Cleburne’s winning heritage of the 70s and 80s, which included election to top legislative offices. Youth and Government describes itself as a “laboratory in citizenship and government,” in providing students with opportunities for involvement in the democratic process. Competing in Appellate, Mock Trial, Legislative or Media events will be Tarek Arouse, Arturo Rolon, Caleb Barkman, Lily Edwards, Keaton Howe, Yemi Tamez, Mason Hill, Hailey Traweek, Cameron Horton, Jack Bennett, Sierra Pugh, Chris Wallace, Nardasha Boaz, Rebekah Lemus, Smith Boles, Reese Williams, Andrew Slimp, Emily Davis, Tabitha Lane, Sarah Roy and Merit Davis. Their Youth and Government Sponsor is CHS government, economics and debate teacher Matt Moulden. Before they ever experienced their first District Youth and Government conference, Arouse, Rolon and Barkman, then juniors, vowed they would be back in 2018. The student organization aligned with the debate skills they were honing as UIL Academics competitors, and exploration and involvement in the legislative and judicial processes intrigued them. Arouse, who finished in the top ten at state in Appellate Team competition, is now leaning toward “something” in law as a career. Rolon, a fellow returning senior, will be competing with Arouse in the Appellate Team event. An avid participant in a variety of speech and debate contests since the ninth grade, he is comfortable preparing, presenting, defending—and arguing—a case, an idea or a point. Barkman, who is a second generation member of Cleburne Youth and Government, is also among the veterans in the program and will be competing again in the Appellate Team event. In addition to their desire to revive the program at their campus, there is also a goal to sustain it as members graduate. Rolon, Arouse and Barkman have waged a three-man campaign to expand interest and participation. Their mission has been accomplished according to Arouse, who says they have gone from “the lonely few” to a Y & G family. Tamez is among the juniors new to the student organization. She will be competing as a lawyer in the mock trial event. Hill, her fellow attorney in the event, said he chose to get involved in a desire to try something new. The Cleburne “Yaggers” have typically averaged 15 hours a week outside the classroom in preparing for the District conference. It’s not been easy, as the participants are also involved in other extracurricular activities and have schedules filled with advanced, college-level courses. Several hold down part-time jobs. Moulden is pleased with the work put in by Cleburne’s Y & G team as they make the final tweaks and touches to their legislative bills, court briefs and testimonies as trial witnesses. These Cleburne High School students will be competing Saturday at the YMCA Youth and Government District Conference. 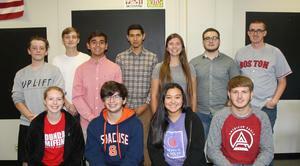 Seated l-r, Sierra Pugh, Cameron Horton, Yemi Tamez, Mason Hill and back from left, Andrew Slimp, Jack Bennett, Arturo Rolon, Tarek Arouse, Tabitha Lane, Caleb Barkman and Faculty Sponsor Matt Moulden. Not pictured are Smith Boles, Reese Williams, Emily Davis, Sarah Roy, Chris Wallace, Hailey Traweek, Nardasha Boaz, Rebekah Lemus, Keaton Howe, Lily Edwards and Merit Davis.